Computer generated render of the "Stanford Bunny"
The Stanford bunny is a computer graphics 3D test model developed by Greg Turk and Marc Levoy in 1994 at Stanford University. 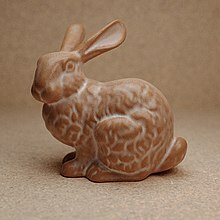 The model consists of data describing 69,451 triangles determined by 3D scanning a ceramic figurine of a rabbit. This figurine and others were scanned to test methods of range scanning physical objects. The data can be used to test various graphics algorithms, including polygonal simplification, compression, and surface smoothing. There are a few complications with this dataset that can occur in any 3D scan data. The model is manifold connected and has holes in the data, some due to scanning limits and some due to the object being hollow. These complications provide a more realistic input for any algorithm that is benchmarked with the Stanford bunny, though by today's standards in terms of geometric complexity and triangle count, it is considered a simple model. The model was originally available in .ply (polygons) file format with 4 different resolutions, 69,451 polygons being the highest. ^ Riener, Robert; Harders, Matthias (2012-04-23). Virtual Reality in Medicine. Springer Science & Business Media. p. 55. ISBN 9781447140115. ^ Turk, Greg; Levoy, Marc (1994-01-01). Zippered Polygon Meshes from Range Images. Proceedings of the 21st Annual Conference on Computer Graphics and Interactive Techniques. SIGGRAPH '94. New York, NY, USA: ACM. pp. 311–318. doi:10.1145/192161.192241. ISBN 978-0897916677. ^ Turk, Mark (August 2000). "The Stanford Bunny". www.cc.gatech.edu. Retrieved 2016-04-06. ^ Lindstrom, P.; Turk, G. (1998-10-01). Fast and memory efficient polygonal simplification. Visualization '98. Proceedings. pp. 279–286. CiteSeerX 10.1.1.452.5851. doi:10.1109/VISUAL.1998.745314. ISBN 978-0-8186-9176-8. The Stanford 3D Scanning Repository provides the Stanford bunny model for download.